Residential PVC-u doors offer a fantastic combination of superb thermal and acoustic insulation, durability, security and weather protection. Even though they feel lightweight, these doors are tough. They cope with all the rough and tumble of a family home, need next to no maintenance and year after year they’ll keep out the cold, the rain and the wind. Steel-reinforced frames and multipoint locks provide all the security you need, but discreetly, because these doors are attractive too. They make a home with a warm welcome and lasting kerb appeal. 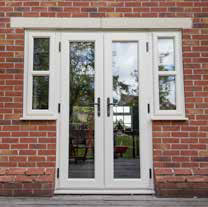 Equally suitable for front and rear entrance doors, there’s a wide range of styles to suit any age or type of home. Glazed and unglazed options, different finishes, panel designs and smart, high-quality door furniture allow you to express you individuality. 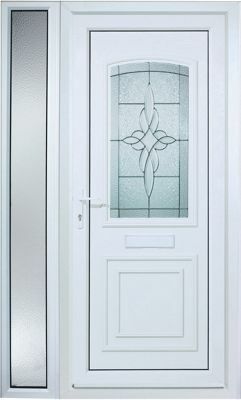 Every product has the power of Yale hardware built in, which means your new PVC-u doors come with the added reassurance of the Yale Lifetime Guarantee. For wider entrances, glazed or matching side panels can provide a beautiful, practical installation that looks great outdoors and indoors. And because we believe in harmony, the frames match our sculptured window so that you can have a consistent look over the whole of your property.